I was talking to my friend AJ last night and it was all talk about interest rates and 401K. Oh, and babies. Because he’s officially an uncle. So jealous! I’m trying to get my brother past “flavor of the week” much less a steady relationship, marriage, or children. We can hold a pretty great microbrew conversation, however. Go figure. With the seasons, the conversation among my patients changed. My topics of counseling changed. 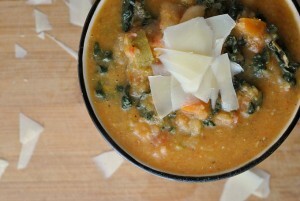 While the fall brought about struggles with beans and dairy products (mmm, cheesy casseroles! 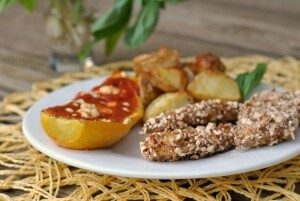 ), the summer offered up the temptation of tomatoes and melon. A group of patients I most recently worked with, LOVED watermelon. It was the one food they missed the most. And that, I can understand and respect. I adore watermelon. I thank God every day that I have my health and that I can enjoy things like Watermelon Salsa without jeopardizing my health. It was actually my old patients who inspired me to 1) buy my first watermelon of the season and 2) try watermelon salsa. Wise, wise patients! This salsa was incredible quick to throw together, though…it doesn’t keep well. Good thing is, it won’t last long enough for that to be an issue! 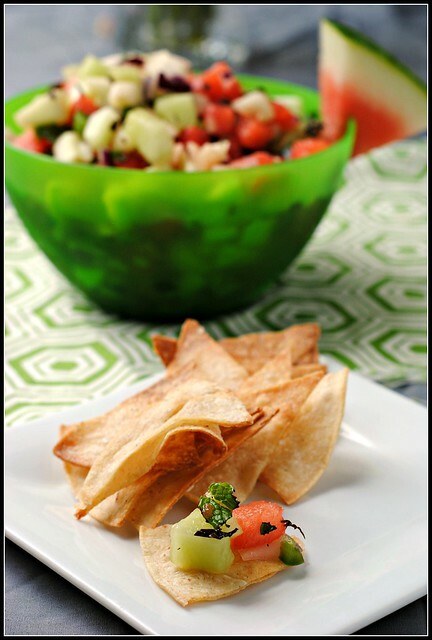 I served this with some homemade baked tortilla chips and it was a great marriage of sweet, juicy watermelon, tart lime juice, and spicy jalapenos. The crystallized ginger added a fun and unexpected twist, too! 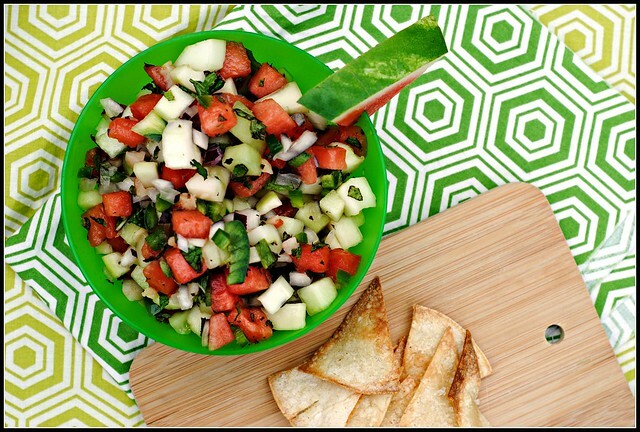 Backyard barbecues and 4th of July are just around the corner…time to break out the watermelon…and salsa! Whisk lime juice and sugar in large bowl until sugar dissolves. 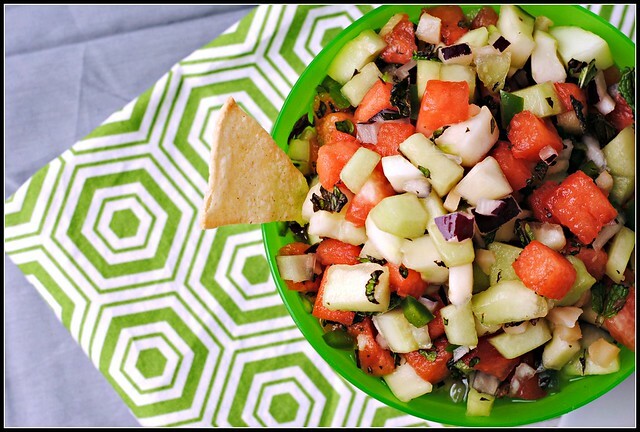 Add watermelon and all remaining ingredients; toss gently. Season with salt and pepper. Can be prepared 2 hours ahead. Cover and chill. Result: Sweet, tart, spicy and an overall fun blend of flavors and textures. This comes together in a jiff and is great on chips. I would also love to try this over some grilled cod or halibut, or as a salsa for fish or pork tacos. Mmm! Enjoy! Dinner with Donna was incredible. I can’t say it was sad because she is one of those people that I know it isn’t a goodbye…it’s a see you later (and soon!). Some people enter your life and you just know they’ll be in it forever — Donna is one of those people. I survived night #2 on an air mattress with the snoring princess. I am packing up the car, putting the final touches on cleaning this joint, and we (Lily and I) are leaving Ohio for good. We close on our new home this afternoon. If all goes well, I will be a Michigan resident by 5pm this evening! Safe travels- hope the move goes smoothly! Hope you and Lily drive safe!! I am going to be in St. Joseph’s Michigan the last weekend in July – is that anywhere near where you’ll be? Biz!!!! Our house is in St. Joe!!!!!!!!!!!!! How cool is that??!! We defintely have to meet for lunch then! My Mom won an auction for a house in St. Joe for the weekend of July 27 – we arrive on Friday and stay until Sunday – so excited!! Funny, I’m working on convincing my brother and his new wife they don’t need to rush into babies! 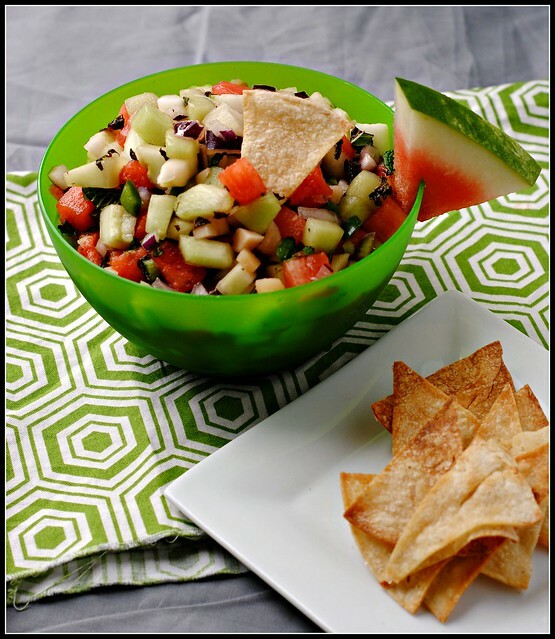 I can’t imagine not being able to eat watermelon salsa…,which is absurdly healthy…for health reasons. Crazy. I had to go to the ER because of a kidney infection this week and I am SO glad it was nothing more serious and can be fixed with antibiotics!